This beautiful, Santa Fe style resort is perfect for a family vacation. The ground floor, one level 2brm cozy condo is just across the the street from the 300 foot private lake front lawn available for your personal use. Walk out on our private docks and jump off the end into the lake. Beside our private spot is a lovely little park and sandy beach for your enjoyment as well. Enjoy all varieties of water-sports on this warm freshwater lake, or if you prefer, paddle around in our complex's pool or hot tub. Our condo is fully furnished including two bedrooms (queen-size bed and double bunks (double on the bottom and single on top) with fluffy duvets, one bath, granite counter tops, and everything you need for a perfect holiday.The area is noted for its golf courses and you are in the midst of world renowned wineries and the amazing fresh fruit grown at the many local orchards. Going wine tasting is a must! Our condo's is perfect for a family with children as our patio is only steps away from the fully gated pool and hot tub area. Next time you are in Osoyoos, please check us out. It will be your choice next time. We came to Osoyoos and fell in love! The climate is fabulous and the wineries are amazing. The town is just the right size. It is a great holiday place for any family. The downtown of Osoyoos is small yet lovely. JoJo's a lovely little coffee shop that serves delicious breakfasts and lunches) is our favourite go to on Main Street. Our building is across the street from the lake. There is a lovely quiet park and beach . Indoor towels only. Be sure to bring along beach towels. There is an ipod dock to play your music. Our complex has a lovely private grassy area across the street at the lake. There are a few excelllent golf courses in the area. We enjoyed this place so much with our twins! (the owners are super nice). This condo is fully equipped with everything! This unit is steps away from the pool, so with children it was so convenient. This condo is decorated so cute, and it is well kept ~ clean and tidy! I would recommend this place to anyone of my family and friends! 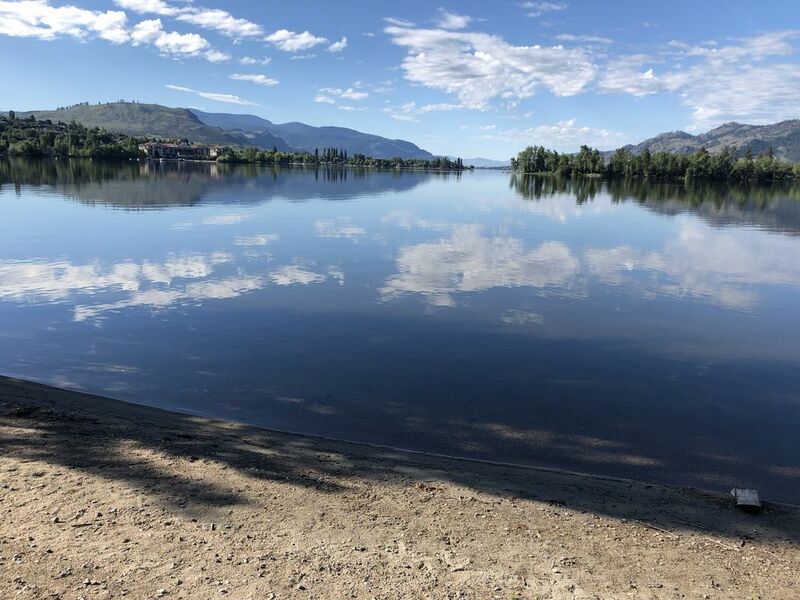 We had a fabulous week in Osoyoos the first week of July. This condo is fantastic! Spacious, nicely decorated and well equipped through out. It was great to be able to travel with our (mellow) dog and leave him in the comfort of the air conditioning while we were out or at the pool. We loved the patio and the close proximity to the pool. It was great having the lake and beach access right across the street - we enjoyed our daily walks on the path. We would highly recommend this vacation property and would definitely return if coming back to Osoyoos. we loved his place...perfect for families! We love Osoyoos and we loved this place! we spent a week at the beginning of the summer and will be back. Having stayed in many VRBO rental this one was one of the best by far. The location, complex, amenities and all the touches of home were perfect. We were travelling with our 2 young children and to have the ground floor unit and a deck that opened right onto the pool was perfect! We loved it and after a week at the the beach followed by the pool, surrounded by quiet and lovely families, gorgeous weather and a short walk to the best ice cream in town we did not want to go home. Everything you need for a warm and wonderful week is here. We have spent from January to April at this wonderful condo. Sari has gone to great lengths to make this a home away from home. Like other reviews have stated she has thought about anything you might need and more. We couldn't and still haven't found the remote for the dvd player. I called Sari and she had it replaced within hours with a new DVD player. This condo is well taken care of. We really enjoyed our stay here and I wouldn't hestate to recommend it to anyone finding a clean, well organized place to stay. The other neat thing was that we could bring our non shedding dog with us. This condo is amazing - it is spacious (larger than it seems in pictures), the layout is perfect, it is clean and maintained well. The pictures don't do it justice, it is way nicer in person. And what really surprised me, is the condo is fully stocked with everything you may want or need. We have rented a lot of vacation properties in the past, and the owners thought of absolutely everything, which we really appreciate! Sari is extremely responsive and great to work with. I totally recommend this property for any family staying in Osoyoos. We are definitely renting this condo again! Rattlesnake Canyon is a really fun amusement park 2 blocks from our condo. The owners keep the park in excellent condition. Great for families. My husband and I really enjoy playing the 18 mini golf. Fabulous ice cream too!